All Pro Entertainment is the best choice for the entertainment at your next event! We have been proudly serving Northern California for over 5 years. We are a company specializing in, but not limited to: Weddings, Corporate Parties, School Dances, Sorority & Frat Parties, Large Venues, Outdoor Shows, and events with large attendance. 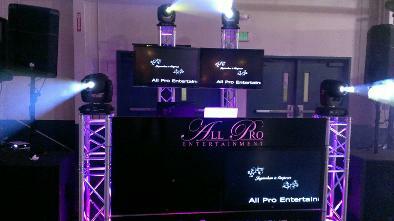 All Pro Entertainment only uses professional sound equipment similar to what they have in nightclubs. This means you get the best possible quality sound available. The difference when hiring our services is that you are using the service of a company owned by Professional DJ's. Specializing from Classics to the latest Top 40s, Hip-Hop, Pop, Disco, R&B, Reggae, Reggaeton, Rock, House, Techno, Retro, Bhangra and Hindi! Our mobile lighting includes a number of effects and a awesome laser light display. Lighting effects available for functions that bring nightclub quality, lighting effects, and sound quality to your party. We offer competitive prices for your event with genuine off peak rates for School Events. Prices vary depending on size and length of functions. Book All Pro Entertainment for your next event. We can take bookings long or short term depending on availability. We will respond within 48 hours.